SpaceX has announced it’s Interplanetary Transport System (ITS), with the goal of sending humans to Mars. While there remains many questions about how such a mission will be achieved, one thing that’s very clear is that the ITS will be the biggest rocket ever constructed. It has to be. Basic physics requires it. The ITS is designed to have more than 13 million Newtons of thrust at sea level, compared to the 3.5 million Newtons of the Saturn V rockets used to send Americans to the Moon. All this while having only about 10% heavier. Such a big increase in thrust vs weight is necessary, because it determines not only how much mass you can lift into Earth orbit, but whether you can get that mass all the way to Mars. It all comes down to delta-V, or how much you can change the velocity of your rocket. When it comes to reaching Earth orbit, bigger is better. The SpaceX ITS should be capable of lifting up to 550 tonnes of payload into low Earth orbit, compared to the 140 tonnes of the Saturn V. This is necessary because a trip to Mars isn’t a few-day trip to the Moon. It will require a larger crew and significantly more food and resources. Once in Earth orbit, getting to Mars will require even more rocket power to overcome what is known as delta-V. This is the amount of speed a spacecraft needs to gain or lose to reach your destination. It takes much more delta-v to reach the surface of Mars than it does the surface of the Moon. To reach Mars you not only have to overcome Earth’s gravity, you have to overcome the Sun’s pull as you travel toward Mars. You also have to account for the fact that the orbital speed of Mars is slower than the orbital speed of Earth. Finally you have to overcome the gravity of Mars to land softly on its surface. All of this adds to the total amount of needed delta-V. To meet this need the SpaceX plans to refuel the ITS in Earth orbit with a second launch. There are ways to minimize your delta-V requirements for an interplanetary mission. One way is to make a close flyby of a different planet. Basically, if you approach a planet in the direction of its orbit (coming up from behind, if you will), then the gravity between the planet and your spacecraft will cause the spacecraft to speed up at the cost of slowing down the planet by a tiny, tiny amount. Making a flyby in the opposite direction can cause your spacecraft to slow down. This costs you nothing in terms of fuel, but takes time because you need to orbit the Sun in just the right way. It’s a common trick used for robotic spacecraft, where we use a flyby of Earth to reach Mars or Jupiter, or a flyby of Jupiter to reach the outer solar system. 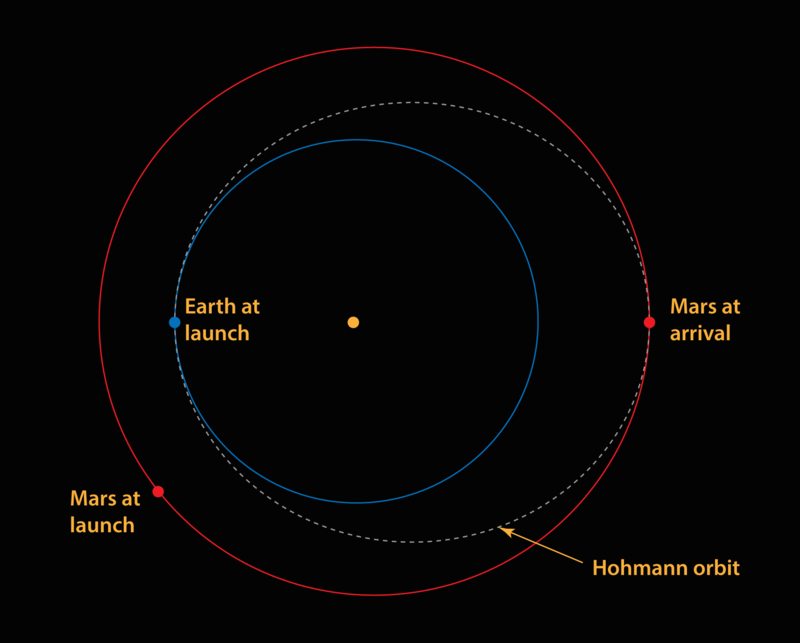 A Hohmann orbit between Earth and Mars. Image by the author. Flybys are cheap and easy for space probes, but they can add years to the time it takes to reach your destination. That’s a big problem for a crewed mission. So the alternative is to look at optimized orbital trajectories. For example, about every two years the positions of Earth and Mars are ideally suited so that a trip needs much less delta-V. This was actually discovered in 1925 by Walter Hohmann, who proposed a trajectory now known as the Hohmann transfer orbit. You could, for example, build a large spacecraft in such an orbit and use it as a shuttle between Earth and Mars. Such an idea was used in the book and movie The Martian. There are other useful tricks, such as using a planets atmosphere to “aerobrake” a spacecraft, significantly reducing its delta-v once it reaches the planet. Since both Earth and Mars have atmospheres this can be used for landing spacecraft. You can also modify the flyby method by thrusting your spacecraft just as it makes its closest approach, in what is known as an Oberth maneuver (another trick used in The Martian). But these will only take you so far. To reach the surface of Mars in a reasonable time, any rocket will require more delta-v than we’ve ever had, which is why the ITS has to be so big. The one up-side of all this is that once SpaceX, Blue Origin, or NASA builds a rocket with enough power to send humans to Mars, lots of other destinations open up as well. The delta-V requirements to reach the asteroids, Jupiter or Saturn aren’t significantly different. If we can land on Mars, we can reach the moons of Jupiter, or even start mining asteroids. Mars is not only an awesome destination, it is also a gateway to the solar system. Thank you for this post. may I post a link to it on my high school physics class’ website (www.linville.ca)? You have a great website. You probably know of the latest news about possible brain damage caused by cosmic rays encountered on the trip to Mars. Instead of shielding the entire ship why not a Magneto( X Men) like personal helmet for each crew member. I’m sure it could be made light and comfortable. There are a lot of medical questions about a trip to Mars. Indeed, it seems that a man who goes to the cold red desert and then returns to Earth may well come back blinded and insane. 1) Is it realistic to use the solar wind to create an artificial magnetic shield around a spacecraft? What are the energy balances, would it be realistic to create spacecrafts (even tiny ones) which use the solar winds to sail like sailboats on oceans without any additional fuell? 2) Is it realistic to create artifical gravity for human space travel, or are the accompanied gyroscopic forces even detrimental? I guess All body needs to be shield from xray not just the head? How many kW is needed to create a strong enough magnetic field for protection around the parts they live in? Hello, thanks for the great post. The chart you linked sparked a question that greatly interests me. I would be very happy if I could get your opinion on this. My goal is to calculate how much energy is needed for a Sun dive, basically fall directly into the Sun. We start from a Earth orbit; given arbitrary amounts of time, which option takes the least dV requirement, first going out to some place in the external solar system and then, once at Apogee, perform the maneuver for the Sun-dive, or perform that directly from Earth orbit? I ask because I see that, the further out you go, the orbital speed of the Planets gets lower and lower. I hope my question is clear and appropriate. 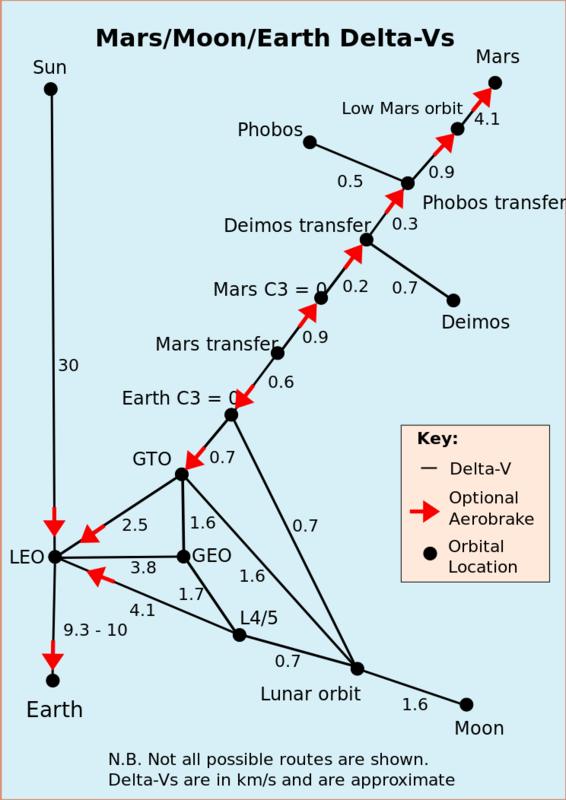 The lowest (by far) delta-V requirements to travel around Solar system can be achieved with the so-called Interplanetary Transfer Network (google it if you are interested, basically it’s clever maneuvering around Lagrange points). Very slow, very cheap. As for your question, direct sundiving from Earth orbit requires cancellation of the Earth’s orbital speed (30 km/s), plus some overhead for leaving Earth gravity, total delta-V required is around 32 km/s. Leaving Solar system by parabolic trajectory requires only ~16 km/s. That trajectory leaves you with speed relative to the Sun approaching zero as you reach the limits of Solar system, so you need very little delta-V to sundive from that position. Really cool reading. Interesting just thinking we will be there in just a decade or so. I think the first trip is planned for 2029. Is that accurate? No One know for sure what will happen to humans when we are far away from earth during a longer time. Logically there shouldn’t be any huge difference. But there is always a small risk that our bodies need to be nearby earth to survive. Right now we assume it’s only the lack of gravity. If we had a station on the moon we would probably been able to find out. How could the ITS have so much more thrust than Saturn V, yet be only 10% more massive? They use the same propellants, more or less (right? ), so it must be a huge difference in the “empty” mass, right? According to college physics, a force (like gravity) changes an object’s state of rest or motion. Force = mass x acceleration. A force of 1 Newton imparts an acceleration of 1 m/s2 to a mass of 1 kg. 1 N = 1 kg m/s2. Hence it takes at least 9.80665 N per kg of mass to (only) counteract the force of gravity. For a reasonable upward acceleration to escape gravity you need considerably more force per kg of launch time rocket mass. A rocket like the Saturn V with at a weight of approximately 3’000 metric tons (3’000’000 kg) needs therefore at least a force of 9.80665 N x 3’000’000 (per kg) = 29’419’950 N just for hovering over the launch pad – and not 3.5 million N as stated in the article. A force of 35 million N seems more appropriate. 13.5 million Newton would only be able to counteract the force of gravity on a vehicle of about 1’350 million kg – or 1’350 metric tons – less than half the weight of a Saturn V. But because ITS is able to launch a payload of 550 tons into LEO, it follows that the forces for ITS given in the article are also off about a factor 10. I guess 135 million N would work. Beyond that I consider this article very interesting. I have a doubt regarding the way Entry to Mars is shown. The spacecraft by SpaceX could face difficulty in stability while entering Mars ‘atmosphere’ like that and Landing like that. They may face huge turbulence due to dust storms on Mars. Whats wrong with entering head-on like other space craft do on re-entry to Earth?